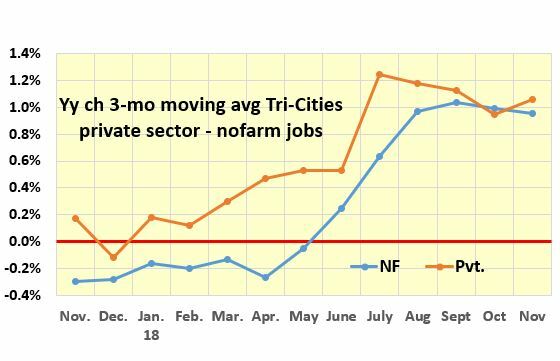 The Tri-Cities’ economy added 800 nonfarm in November, employment increased by 672 people and the unemployment rate dropped to 3.5%. It was the best November total since 2008 and only 100 jobs shy of the pre-recession high, according to Bureau of Labor Statistics non-adjusted preliminary numbers. That’s a retreat from October when there were 100 more jobs than before the Great Recession for the first time. All the data points to a labor market at full employment – one where everyone who wants a job can find one. What it doesn’t address is the quality of the jobs. The local market has not shown the job creation softness seen in the national reports, yet. However, the local trend is pointing toward a gradual slowing. November’s job creation trend was an extension of a five-month pattern of uneven growth for the region’s two metro areas. The Kingsport-Bristol Metropolitan Statistical Area’s (MSA) job creation moving average trend has posted year-over-year increases of 1% or better since July. That’s pretty solid growth. At the same time, the Johnson City metro area has recovered from job losses during the first half of the year, but growth is sluggish. The year-over-year gains have been in the 0.2% to 0.4% range since August. During the first half of the year, Johnson City was the only MSA in the state reporting job losses. 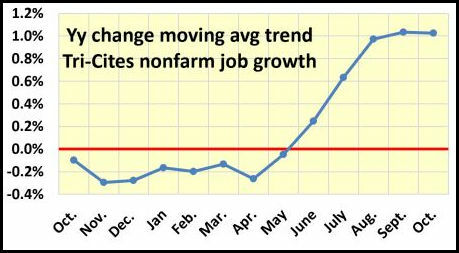 The bulk of November’s new job creation came in the four-county Kingsport-Bristol MSA, which added 1,300 new jobs. That gain was reduced by a net loss of 500 jobs in the three-county Johnson City MSA. Kingsport-Bristol labor sectors with net job gains over October’s totals were manufacturing; trade, transportation and utilities; professional and business services, leisure and hospitality; and government. 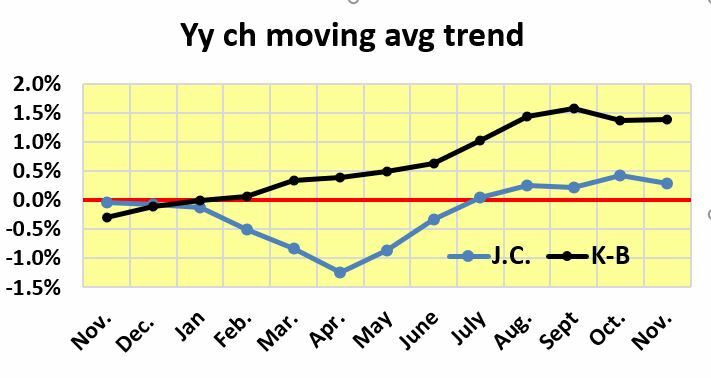 The only Johnson City sector showing a net gain over October was an increase of 300 in the trade, transportation and utility sector. Private sector wages were also mixed in November. The average Johnson City hourly wage was $20.01 down from October $20.14. The annual average for 2017 was $19.33. Kingsport-Bristol private sectors saw their average increase to $18.40 an hour from $18.30 in October. The annual average was $17.95. The Tri-Cities have some of the lowest private sector wages in Tennessee, and since a little over 16% of the local workers are government employees, their higher salaries raise the household median wages cited in most government reports. An analysis of government sector wages compared to private sector wages in the Tri-Cities can be found by CLICKING HERE. Both the labor force and employment has been positive since September in the region. Compared to pre-recession benchmarks the region’s labor force is down 20,105 and employment is down 12,318. Much of that is a result of the region’s rapidly aging population. Currently, an average of 18 Tri-Cities residents turns 70 every day. That has reduced the region’s labor force participation rate and is one driver for the area’s slow gross domestic product (GDP) growth. Last year was the best economy the Tri-Cities has seen in five years. It was the first year since 2012 when the seven-county area posted real economic growth from the previous year. With that said, 2017’s real total economic output – gross domestic product (GDP) – has declined 5.7% ($979 million) from its 2011 peak, according to recently released data from the Bureau of Economic Analysis (BEA).